Greatwhite Webstudio is where we merge art and functionality to provide an beautiful online presence. builds professional, responsive websites complimenting and enhancing your brand. Web development is our core. Websites are a reference point for potential clients it could tell a story of your business good or bad, the majority of people tend to judge a company by its website. We create functional responsive current trend websites that keep the attention of a potential client. We design websites to be user-friendly keeping it simple. We deliver Projects on time, on budget and to the highest quality.Following the latest trends is important in order to promote your brand as fresh and current, we strive to bring in design elements that add value to the user experience. Websites and web development frameworks and CMS platforms, such as Bootstrap 4, Angular 5, WordPress offer clean fast and functional web applications and websites. Google ranking can help your business grow a lot faster and is important for the presence of your brand to be visible.We provide affordable website design solutions because we understand that cash flow can be tight for small businesses and startups. We would love to be part of your journey from day one, helping you grow and watching you excel. GreatWhite Webstudio is here to service your Web development needs whether it be a Website, online store, mailers or a Web Application we have the expertise, experience and knowledge to deliver. 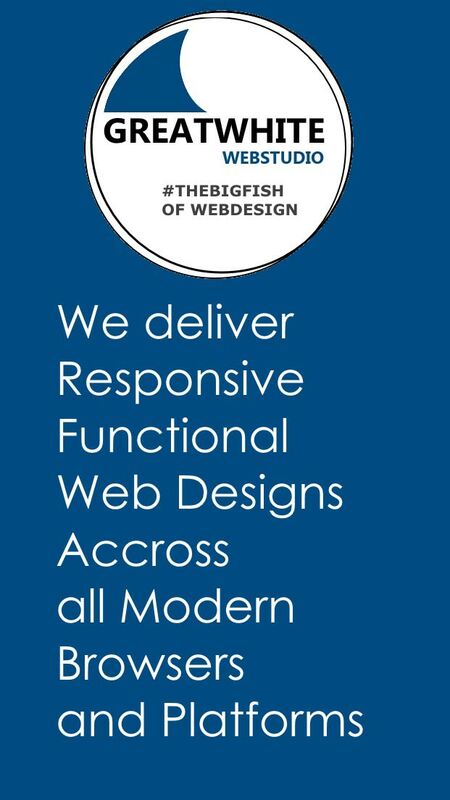 Our ability to build functional Responsive websites with the flavor of current trends is our recipe to your success. The need for websites to be compatible with all devices and have the user experience of navigating a site as simple as possible has become a key requirement for all web development. Taking the website from an thought to a process, and across the finish line to a reality is our goal. At GreatWhite Webstudio we put time and effort into understanding your brand and help you with the design and profiling of it. Britain's Prince Harry and Meghan Markle just got married at the at St. George's Chapel in the grounds of Windsor. Months of preperation and anticipation and the day has finally arrived. Congratulations to Harry and Meghan. A value add to Web development projects is correct branding. Alot can be said about branding, the reality is that it is fact that we sometimes make decisions through our subconsciousness and being able to either positively identify a brand or negatively depending entirely on our experience with the brand. I wont forget one day seeing a Large helium balloon in the sky from a distance. It was too far for me to read or even see the shape of the branding on the balloon as it was at an angle too that i was viewing it. However I immediately recognised it because of the use in combination of the colours. The Brands we remember are the most recognizable ones. Consistency in the display and design of these brands keep it that way. It's not a good idea to change your branding unless it's really outdated. "Mark completed this project for me quickly with an attention to detail. He was prompt to respond to my feedback and made changes quickly. I would definitely recommend Mark." "Working with Mark was such a great experience. He was very professional, creative, on time, and truly cared about the project outside of just the paycheck. If you need any form of web work done you will not find a better guy who will work as if he has been on your team since day 1. We can not say enough good things about Mark." "Mark contacted me promptly and started work immediately helping me to make changes and creating a site I can be proud of. I will definitely use Mark again." Let's help them find you! © Greatwhite Webstudio 2018. All Rights Reserved.